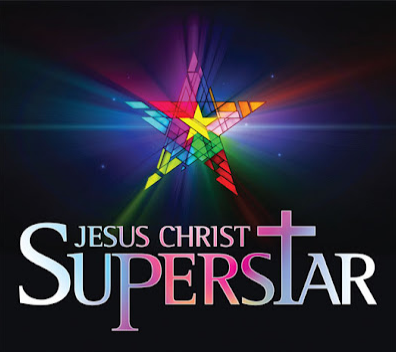 The publicity surrounding this newly revitalised Jesus Christ Superstar has been plentiful and vocal. From the naysayers who have decried it before even seeing it, to those railing against the snobbery surrounding it, who welcome the extravaganza with open arms. For what it’s worth here are my thoughts. The score of this musical is demanding on its performers and success of this piece almost always hinges on the abilities of the singers involved. 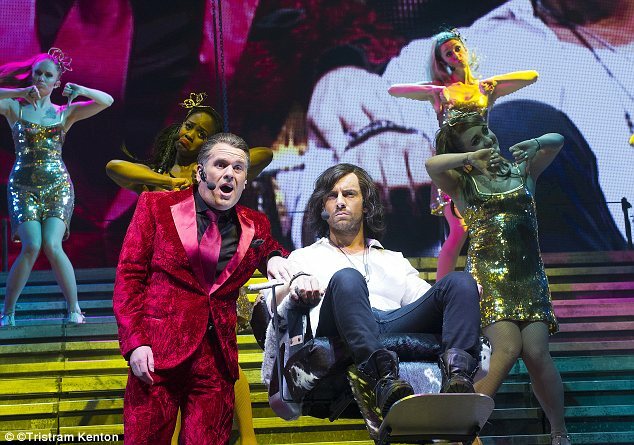 Search for a Superstar winner Ben Forster may have manged to belt out a few numbers on his TV journey to the role of Jesus but here his limited vocal range is exposed – fine when he’s in range but seriously under-powered when he’s not. His acting skills are also woefully limited, swinging between pained and pouting and not much else. Melanie C is an anaemic Mary Magdalene – again vocally under-powered and is in possession of a rather ear-grating nasal whine. 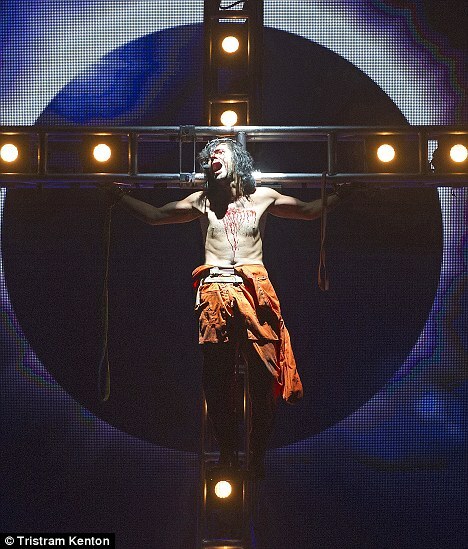 The stand out star turn and power-house performance of the night is given by Tim Minchin who conveys the anger and anguish of Judas beautifully, though his vocals sometimes suffer from the efforts of his acting. Chris Moyles as Herod, only on stage for 3 minutes, milks it for all it’s worth and equips himself with more aplomb than you would imagine. Sheer theatrical class though is displayed by Alexander Hanson as Pilate whose experience on stage shows his younger counterparts how it should be done. Beautiful acting and a fantastic voice. Director Laurence Connor brings us a rather rawer and grittier setting for this production: referencing the London riots of last summer, Guantanamo Bay, the Occupy movement and reality TV, indeed, the re-staging is one of the highlights of the production. My only complaint would be the sheer vastness of both the stage and the cast, often rendering the detail and any ensemble performances invisible. However there was a large and very vocal number of audience members at the SECC last night complaining that they had absolutely no view of the stage in their £65 seats. The action takes place in the centre of a square set with enormous scaffolding (containing the musicians) rising either side to the ceiling. However, this rendered the action completely invisible for anyone who wasn’t dead-straight, centre-front of the stage. The enormous screen at the rear of the stage which may have helped some of the audience follow the action was also completely obliterated by the staging. This has always been one of my favourite musicals, it is certainly the musical I’ve seen the most and I’ve seen it staged in many forms. The experience, though a thoroughly enjoyable one, left me with a feeling that something was missing, it was neither fish nor fowl – never fully embracing its theatrical origins and never fully submitting itself to the full rock concert experience. It was a new and not entirely successful hybrid. Fundamentally this is a piece of theatre and despite its pounding rock score the subtleties, emotion and often delicate power that sets it apart from the rest has been lost in this vast arena. 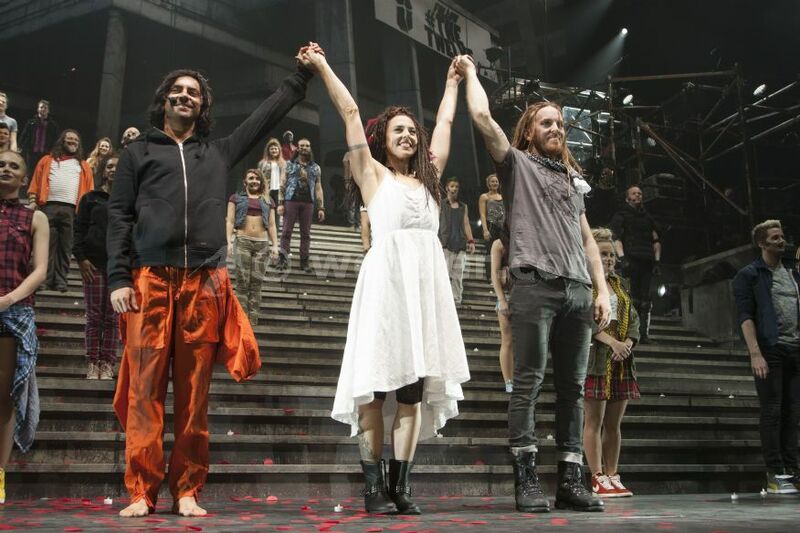 Enjoy the rock spectacle, marvel at the size of the cast, revel in seeing Tim Minchin give a glimpse of his genius but take it from me – this is a beautifully written piece and is best seen at its simplest, I hope that those who see this for the first time here, go and see it in a theatre if it ever tours again.